Goodnews Bay eighth grader Tucker Evans leaps in the air during the One-Foot High Kick. He says that his cast throws off his balance but increases his momentum. 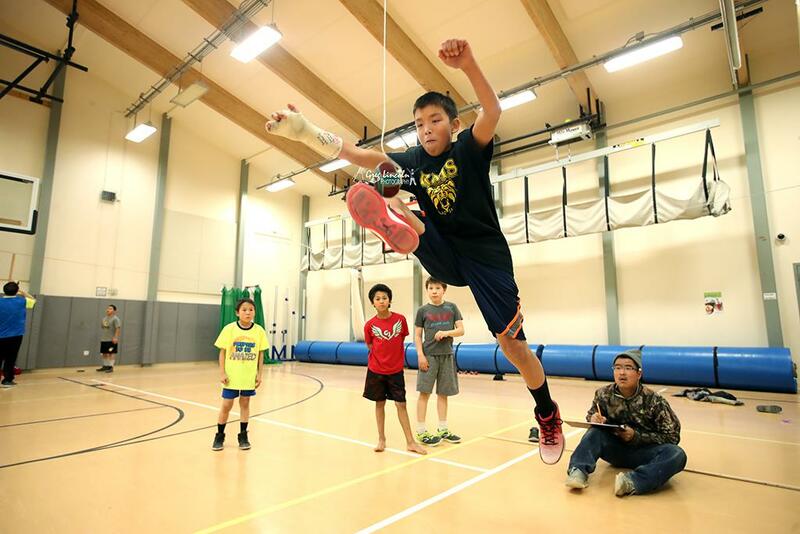 Only three of the six teams were able to make the trip due to poor weather, but Bethel’s Native Youth Olympic Invitational went on as scheduled. Teams arrived by boat and small planes through thick fog to compete in the traditional games of strength and endurance at Bethel’s Gladys Jung Elementary School. A ball hangs in midair: an orb of turquoise blue and spotted seal fur, suspended on a string and connected to a tall, wooden tripod. Bethel Gladys Jung sixth-grader Jordan Klejka approaches. She runs her fingers down the twine, steadying the ball. It hangs just below her bright blue eyes, 49 inches from the ground. Klejka steps back. Pauses. Then, in a sudden motion, she jackknifes her body, lifting both feet and kicking the ball. The ball soars in a wide arc and Klejka lands on her red sneakers, winning the Junior High School Girls’ Two-Foot High Kick. Oscarville takes second place. NYO is the small school’s only sport. With about a dozen students, Oscarville doesn’t have a gym. Instead, chaperone Eliza Joekay said that the students practice in classrooms. That can be challenging. “One time they did seal hop, and they went inside the school, but they had to make sure the doors were open wide so they could turn,” Joekay said. During the seal hop this weekend, eleventh grader Brenda Mark from Goodnews Bay takes the lead. She bounces her body in a push-up position across the floor. Arms straight, hands flat, toes pointed; her chipped purple nail polish sparkles against the blond wood floor. Three-quarters of the way across, she collapses and holds her position. Another athlete runs the tape measure from the starting line to Mark’s fingertips. “72 feet, 5 inches, for Brenda Mark,” the judge announced. After others fail to match or exceed her, Mark receives a blue ribbon for first place. She says that taking up yoga helped her increase her distance. Fletcher Hughes, Mark’s coach at Goodnews Bay, moved from Pennsylvania last year and began learning how to coach a sport unique to Alaska. Hughes had coached baseball, basketball and soccer in the past. To learn these new sports, he began watching NYO videos online. “Had a couple of young men from last year increase their kick by 12 and 14 inches, so I felt like I was doing alright with it,” Hughes said, smiling. NYO events prepare athletes for subsistence activities. High kicks were used to signal a successful hunt. The seal hop builds stamina and trains hunters to sneak up on seals. The wrist carry, where athletes hang from a wooden pole by one wrist, tests strength and endurance while respectfully emulating an animal giving itself. Oscarville eleventh grader Trevor Mesak said that the training also works in reverse. Subsistence prepares athletes for sports. “Especially the seal, and carrying the moose always helps because it gets you stronger and more stamina,” Mesak said. the rare times they get to run the length of a full court. Then Bethel’s Gladys Jung coach Tommy Bayayok wheels out a cart piled with brightly colored ribbons. One by one, he calls out the top scores and the athletes’ names. And one by one, students walk up and collect their awards, leaving the tournament with fistfuls of silky ribbons. Anna Rose MacArthur is a reporter at KYUK in Bethel.